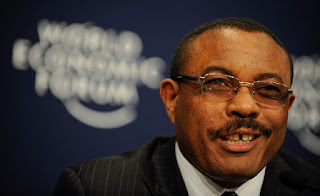 Following the death of Ethiopian despot Meles Zenawi, his handpicked deputy prime minister and foreign minister, Hailemariam Desalegn, was appointed the acting PM by the Council of Ministers. But beneath this important title, Hailemariam is virtually seen as a figurehead. His infant reign in power has been described as being, "a Medvedev for a group of Putins in the ruling party," a reference to Russia's leadership structure. By placing Hailemariam as the acting PM until 2015, the ruling party wants to buy time to fix their internal squables, while at the same time, give the illusion to donor countries that a non-Tigrayan leadership is at the helm. For TPLF top brass, Hailemariam is not seen as a threat. He has no party to support him and has become the face of a shadow government he has no say in. Meles' demise and his lack of succession plan, has had a devastating effect on his former administration. For the first time since the 2001 power struggle, the regime is in a precarious situation. Reports have indicated a number of splinter groups have already emerged; each backing a senior official who they feel should rule the country of 85 million. Some of these TPLF bigwigs vying to rule Ethiopia are Seyoum Mesfin, Bereket Simon, Samora Yunis, Getachew Assefa, and Sebhat Nega. These five individuals have the most influence, political experience and are generally seen as the top brass of the party by regional analyst. Seyoum Mesfin: He was the former foreign minister before being replaced by Hailemariam Desalegn, in an unpopular power shuffle by Meles in 2010. He was very much critical of the move and solidified his long held belief that Meles was simply a one-man-regime. Prior to becoming Ethiopia's Ambassador to China, he was generally regarded as the second most prominent figure within the TPLF. With the death of his former comrade and rival, look for him to muscle in for control. Bereket Simon: Out of all the regime heavy-weights, he's been the most faithful to Meles. This is largely due to the fact that within the party, he's very much disliked. For him, Meles was a way to climb within the political ladder. He is of Eritrean in origin and many view him with suspicion, even though he fought for the TPLF organization as a guerrilla fighter. Samora Yuinis: Described as a 'paranoid' general by the former U.S. Ambassador to Ethiopia, David Shin, General Samora has been the head of Ethiopian National Defense forces since 2007, a title given to him by Meles as a reward for his staunch loyalty. With Meles' death, the 57-year-old general is seen as being in a position of strength. Many TPLF splinter groups are soliciting him to take power from their political rivals. Getachew Assefa: Since 2001, Getcha has been the head of the Ethiopian National Security and Intelligence Service, a position appointed to him by Meles. Like Samora, Getachew is a paranoid and secretive man. He's been known to arrest people for simply taken a picture of him. He likes to stay in the shadows, but is very much an influential figure within the party. Sebhat Nega: He's the founder of the TPLF and was the leader until the 3rd congress in 1991, when Meles was voted in to power by his comrades. Out of all the senior officials, he's the most staunch advocate of Tigrayan nationalism. Within the party, Sebhat is known as a 'loose canon'. He criticized Meles in 2009 for his dictatorship and corruption, a move that ignited Meles' 2010 power reshuffle of senior political and military officials.